Elizabeth Susan Koshy performed a hat-trick as she won the Women’s 50m Rifle Three Position gold for the third time with a dominant performance in the 59th National shooting championship at the Dr. Karni Singh Range, New Delhi, on Friday. The 21-year-old Elizabeth who agonisingly missed out on an Olympic berth when she placed ninth in the ISSF World Cup at Munich earlier this year, was a class act in the final today, as she beat Anjum Moudgil once again for the gold, with a new final national record of 459.3. She bettered her score of 452.0 that she had shot in the national championship at the same venue in 2013. Except for the first series of five shots in kneeling when the National junior champion N. Gaayathri led ahead of her, Elizabeth led throughout the 45-shot final, as she beat qualification topper Anjum by 10.5 points. She had beaten the Chandigarh girl last year in Pune as well, by a four-point margin. Even though she had shot 578 in qualification and was third behind Anjum and former national champion Meena Kumari, the Kerala girl was able to assert herself in the final, in which Tejaswini Sawwant, Tejaswini Muley, Meena Kumari, Raj Chaudhary and KC Hema finished fourth to eighth in that order. Perhaps, the good behaviour of the spectators who did not make a noise despite repeated pleas to do so by the officials, as the new rules allow all sorts of music and noise during the finals, helped Elizabeth focus on the target well. If she recaptures such form during the Asian Olympic qualification event in January at the same venue, Elizabeth will have a fair chance for a shot at Rio. 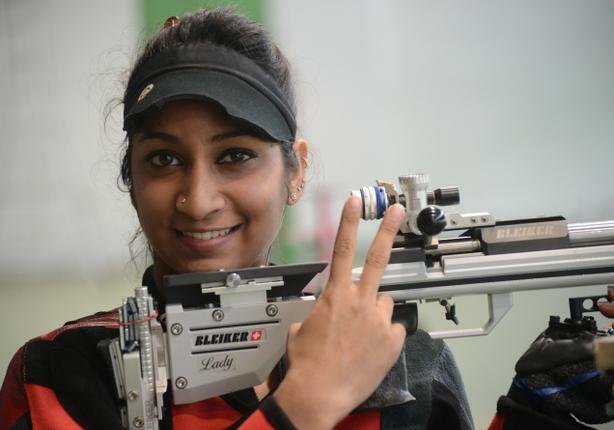 The young Gaayathri who has been shooting well in recent months, kept pace with Elizabeth till the 30 shots in the prone and kneeling positions. Eventually, shedrifted down in the more demanding, standing position. World Cup silver medallist and the bronze medallist of the last edition, Laja Gauswami shot 571 and missed the final by two points. Three-time Olympian, Anjali Bhagwat shot 573 and missed the final on the basis of lesser number of inner-10s. Women’s 50m Rifle Three Position: 1. Elizabeth Susan Koshy 459.3 (NR) 578; 2. Anjum Moudgil 448.8 (581); 3. N. Gaayathri 435.6 (575). Junior Women’s 50m Rifle Three Position: 1. N. Gaayathri 575; 2. Aditi Singh 570; 3. Shreya 567.